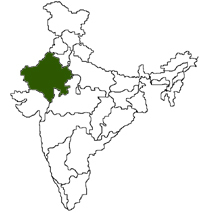 Rajasthan, the largest state of India was formed on 30 March 1949 with Jaipur as the state capital. Once known as the 'Land of the Kings', the state still retains the glory and richness of those times with its marvelous monuments, colourful traditions and customs. It covers most of the area of the Great Indian desert (Thar Desert) with one edge paralleling the Sutlej - Indus river valley along with its border with Pakistan. It borders Pakistan to the west, the Indian state of Gujarat to the southwest, Madhya Pradesh to the southeast, Uttar Pradesh and Haryana to the northeast and Punjab to the north.Rajasthani and Hindi are the widely used languages in the state. 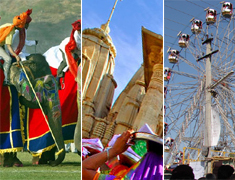 Rajasthan has an unending cycle of fairs and festivals throughout the year. They are perhaps the most colourful and spectacular in the whole of India. Known as the 'Land of Palaces and Forts', Rajasthan situated in the Northern part of India is decked with alluring palaces, magnificent forts, a rich culture and heritage. 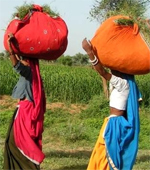 Music and dance are deep rooted in Rajasthani life. The Desert land comes alive when it stage for performance. 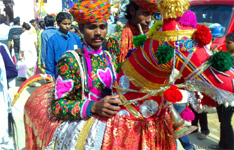 Most of the Rajasthani Folk arts are linked to either region or Festival. Folk dances of Rajasthan has been classified according to the three natural division of the region - hilly, desert and eastern plain including Shekhawati. .More..
Music and dance are two very important aspects of the folklore of any region. The Ravanhattha, ektara and sarangi are the stringed instruments used with folk-songs..
Rajasthan is the largest state in the Indian Union. 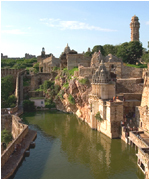 Geographically, the land of Rajasthan is more varied than any other region. It is a region of lofty rocks, rolling sand dunes, of burning heat and freezing cold, of fertile plains and deep wild glens and jungles.